Since I did that first graph some years ago new data has become available. It is a very time specific relationship. If you assume most house purchases had a 25% deposit, you can look at the quarterly amounts that were loaned in mortgages, the red line in this graph is the actual amount that was spent on houses (we know this now at a quarterly level through better data). 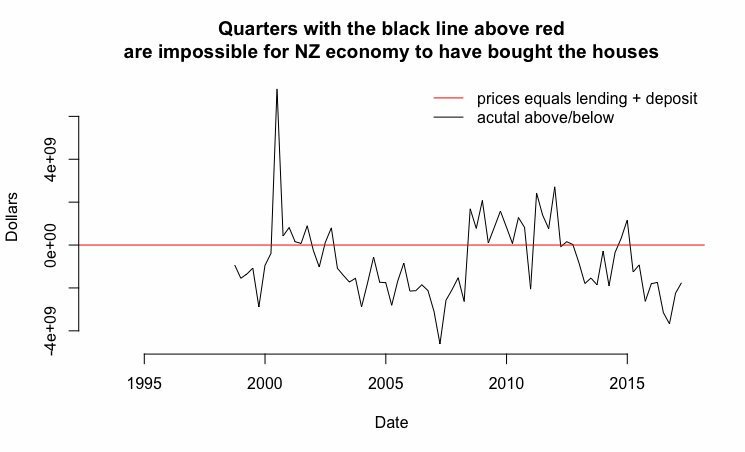 Most of the time the amount the black line (amount borrowed in mortgages + 25% deposit) is below the red, which is easily explainable by the average deposits in that quarter being above 25%. The times when the black line is above the red are when the pattern is not explicable by the long term finance pattern (stretching back to when records are available, detailed quarterly data is only from the late 90s). The 6 billion dollars more than explained by the NZ economy surge in a single quarter of 2001 matches in time when the Australian Government allowed negative gearing to be applied to Australians’ investments in foreign property. That wall of money was the initial surge that soaked up all the spare capacity for what is perceived as the 2003 bubble, from which NZ has never recovered. Subsequent bubbles have been bubbles on bubbles. I would also make the prediction that if Australia ever changes its negative gearing rules, we will see the results play out in the New Zealand property market. Bitcoin is typically hashed using ASICs which are far more energy efficient. Have any of the crypto-currency/blockchain people solved the fundamental problem of power consumption? From a Motherboard/Vice article yesterday Ethereum transactions are estimated to take 45 kilowatt-hours of electricity per transaction, VISA is estimated at 0.00651 kWh per transaction. rather than the 1-2 you’d expect from the 1% number. The expect really hinges on how much damage you expect people to take in an accident- giving the prevailing wisdom that the short term risk is balanced by the long term health benefits it starts to devolve into arguments about what a reasonable rate is. Broadly speaking I would say everyone is safer in their own custom transport space, and pretty much all the risk is at shared spaces (i.e. intersections where all three groups intermix unavoidably). Starting to get a few numbers in (some hospital data and road use data). In terms of fear of cycling and risks, cyclists have about as much risk of hospitalisation/death from stationary objects as cars (but the stationary objects are not in the hands of other people which is where the fear comes from). For pedestrians if we take km traveled as an indicator of how much they are on the road, cyclists is almost exactly 1% of cars, however among pedestrian hospitalisations collisions with cyclists are at a rate of 2.83% of cars (95% confidence interval 1.84 to 4.2) suggesting that for hospitalisation injuries the risk to pedestrians is higher per cycle than per car. so I’m not sure shared pedestrian/cycleways are without drawbacks for bike-commutes. In the NZ case, historically, the answer would have to be “not much”, because cyclists and pedestrians weren’t supposed to be sharing paths. For pedestrians, I think hospital stats show it a pretty major thing at intersections or road crossing- pedestrian risk is very low on the footpath then skyrockets to massive when they have to leave them (basically once a block) and share space with anyone else. It is not an even impact- older pedestrians (and there is a very big difference in the age profiles between cyclists and pedestrians) are fragile with respect to being struck by cycles in a way that younger people are less so. I am in the early stages of sounding out getting some data in this area. Does the decrease in the number of cyclists also decrease the incidence of pedestrian vs cyclist injuries - These wouldn't get tracked if you were basing measures of injury on NZTA figures via police reports, as I understand it the NZTA figures are essentially "car vs. ..." (for example if you look at hospitalisations I understand the leading injury for cyclists is themselves- falling over when no other party is involved).